* The Moon, rather than the sun, is associated with the Supreme God among the Kamitians and among todays people living along the Nile, Congo and Niger. Budge notes that new moon festivals is found all over Africa and is commonly associated, as it was in Kamit, with the remembrance, by kings and commoners, of their sins, and by prayers for protection from evil spirits. He cited examples such as the Mendi, Tshi (also known as the Oji tribe are a group of people living in Ghana), and Ilogo (Central Africa Republic) and various peoples in the Sudan and Tanganyika. Note the yowa and maa aankh cosmogram. *The Kamitian concept of the ka, meaning "double" has its counterpart throughout wide regions of Africa. Among the Tshi it is known as the kra or kla meaning "soul" and as doshi among the Bantu (in South Africa) which means literally "double" (as in the Kamitian). In both Kamit and the rest of Africa, the ka differs from the Western idea of "soul." The Kamitians and the modern African had the idea of at least three types of "souls" inhabiting each person. The ka is an immaterial double of the physical body that persists after death. The ka though is distinct from the person, is a type of guardian spirit. The ka in both Africa and Kamit must be cared for after a person dies or the ka itself will perish. Kamitians and Africans made images in which the ka dwelt and to these were offered meals and worship. *The sahu or "spirit-body" arose in the "Other World" after one's death. Among the Tshi, the "shadowy person" that comes to live in the "Other World" after death is known as the Srahman. Similar ideas were cited among the West African tribes of Yoruba, Uvengwa and Baluba. Like the ba, the sahu could perish in certain circumstances. *The Kamitians considered the shadow or khaibit as a type of "soul." Similar beliefs among the Nsism, Wanyamwesi, Nandi and busuko and in various parts of the Lower Niger, Congo, Southern Guinea and Mashonaland were mentioned by Budge. *The khu was the imperishable spirit and had its counterpart in the "dual soul" concept of West Africa. The belief in transmigration of the dual soul and shadow was common in Africa. 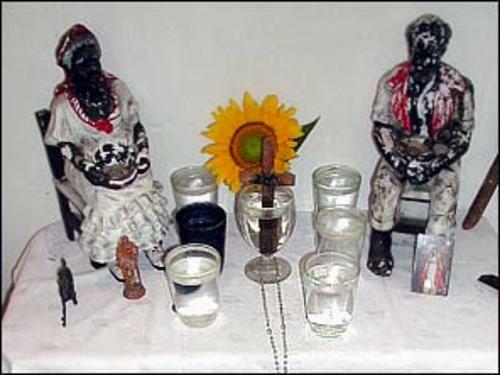 Reincarnation was widely found among the people of the Niger Delta who made a practice of identifying which people in a community were the souls of persons deceased in earlier times. 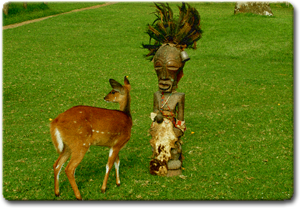 Among the Pygmies, Banza and West Mubangi the spirit was reincarnated in animal form and this type of belief was held by some segments of the Kamitian population. * In Kamit, offerings were made to ancestors in the form of meals placed on a stone slabs in the ancestor's tomb. Budge's notes that stone slabs were used for the same purpose among the Buvuma islanders (Ruvuma and Soga tribes of the coast of Uganda). The offering of meals to ancestors in spiritual temples or houses is widely found through much of Africa and Budge cites examples among the Bakongo people (aka. the Kongo) who dwell along the Atlantic coast of Africa from Pointe-Noire, Congo (Brazzaville) to Luanda, Angola, the Sukuma people (aka. Basukuma, Wasukuma, Zukuma) live in small villages in the northern part of Tanzania, Makarakas (Southern Sudanese tribe), and in East and West African peoples. *Deification of ancestor heroes is common practice in much of Africa. Budge noted that Osar (Asar, Osiris) in the form of Khenti-Amenti stands as an ancestor God of Kamit while Oset (Aset, Isis) is the ancestor Goddess. He noted the uncanny resemblance between the widespread African practice of giving birth in the "bush" to a bas relief found at Philae. Among Africans, birth in the bush is done in solitude with the father and the shaman waiting in the comfortable distance until after the delivery. The bas relief at Philae shows Oset (Aset, Isis) in a stylized papyrus swamp suckling Hru (Heru, Horus). The papyrus would thus stand for the "bush." Standing on either side of Oset (Aset, Isis) is Amun Ra, representing the African father, and Djahuti (Tehuti, Thoth) representing the African shaman. Budge thought the symbol found under Oset (Aset, Isis) could represent the placenta and blood associated with child birth. Interestingly, Budge cited a passage in which Oset (Aset, Isis) speaks of her loneliness during labor, which mirrors the African tradition of giving child birth in solitude. Examples were given about tribes in Sudan (Nuba, Nuer, Dinka, Shilluk) and Uganda. *The importance of the cow as the most sacred of animals is found in Kamit and in many parts of Africa especially among the tribes living along the Nile and in the Great Lakes region. Of particular importance was the sacrifice of bulls at the funerals of the deceased. The sacrifice of two bulls at funerals is detailed in "The Opening of the Mouth." *Amulets were seen as partial residences for ancestral spirits in Kamit and throughout Africa. Budge noted the "fetish" quality of amulets, often stressed by Western observers, is secondary to the importance of communion with the ancestors. *The beetle and the frog are amulets of new life in both Kamit and modern Africa. *The tall hats and horned crowns worn by African chiefs resemble the white crown and horned crowns worn by Osar (Asar, Osiris). Examples given among the Congo tribes of Bayanzi, Imbangela, Lomari, Lulongo-Maringo, Bangala, Ngombe (a.k.a. Poto), Alunda. Two ostrich feathers decorate the crown of Osar (Asar, Osiris). Also, these feathers were worn by various peoples of Africa. *The plaited beard, which was common in Kamitian art, were common among the Markakas, Mpungu (of Namibia), Fang, Alunda (of Congo) and Luba (of Central Africa), as well as other parts of Africa. *The scalework on the body of Osar (Asar, Osiris) is thought to be related to the body painting or tattooing found various African peoples particularly those in Sudan. *The mention of the jawbones of the deceased Unas, Re-stau amd enemies of Hru (Heru, Horus) in Kamitian texts are explained by the African practice of removing and preserving the jawbones of kings, or using the jawbones of enemies as trophies. Specifically mentioned are the Sudani, Dahomey, Baganda, Ashante, and various peoples of Uganda. *Both modern Africans and Kamitians took care to protect the buried body from contact with the earth, was seen as contaminating. The African burial usually consists of a deep pit, which a niche is carved so that the body does not come into contact with the earth. The Kamitian tomb was also built in a pit with a sarcophagus taking the role of the niche. In some African burials the niche was sealed off with stones as with the Kamitian sarcophagus. *The Kamitians, like modern Africans, saw the journey to the "Other World" after death as difficult. In both cases, rituals were performed to "open the way" for the deceased. *The Kamitian concept of Duat found its counterpart in the African "God's Town" or "Njambi's Town." *The concept of divine kingship linked ancient and modern cultures. *Budge noted that spitting had a religious meaning among Kamitians. He found similar beliefs among the Kordofan, Dyur, Barotze (Zambezi), Nandi, Suk, Kytch and Masa. *The use of multiple "mighty names" among Kamitians was similar to the use of "strong names" among African peoples. *Budge mentions that the Kamitians commonly made figures of steatopygous women. He mentions mentions specifically the dolls and representations at the 4th Kamitian room in the British museum. He compares these with the figures of the steatopygous queen and the princess of Punt.